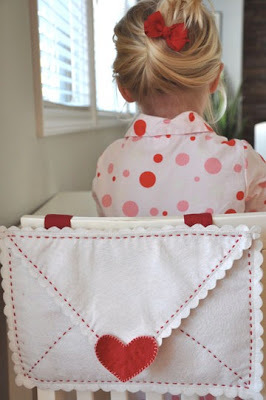 A couple of weeks back, I saw this darling PB Kids Valentine's pocket on this fabulous blog. I decided that would be my Valentine's project for this year. But when I sat down to sew them up I discovered that my sewing machine needle was broken...and get this...I didn't have a spare. Nope. Nada. Sigh. What's a crafty mom in a time crunch to do? Enter big blue. My glue gun, that is. I just hot glued them together. They didn't have any of the decorative stitching I had planned on, but they turned out cute just the same. And they literally took me 10 minutes each...including all the prep work. So even though I'm posting them the day before Valentine's day, you can still finish them in time. Really. What do I plan to do with these? Well, I plan on having the family write love notes to one another and we'll stuff them in the envelope, and then read them at dinner on Valentine's day. My sister and her family are here from California, so I made an one for them as well. I sense the start of a nice Valentine's day tradition. Well, I would expect you to be nothing less than the resourceful person that you are. Fabulous! I love the idea of love notes. Your envelope came out fabulous. Of course when all else fails....hot glue to the rescue! This turned out great. I think I like it better than the original. Honestly like your version better than the original - such a cute idea. Happy Valentine's Day and best of luck with your new tradition. What a cute, cute project! I'm going to have to remember this one for next year! I like yours better. So cute and what a great idea. I love those! Thanks for posting it. I'm definitely keeping it mind for next year. adorable and what a sweet tradition! Those are adorable and sounds like the start of a wonderful tradition! Happy Valentine's Day! You always make me smile. I love that you didn't let the needle stop you. I also like that I am not the only one that this has happened to. I love this idea and think they would be great on the chairs all of Feb. Thank you for inspiring me again. I just adore these... wish I had fabric tonight to make them for tomorrow... uggghhh all our snow has left me so unprepared for tomorrow.... i guess lots of hugs and kisses will have to do! Very cute! I love that the lack of a sewing needle (and today's events) didn't stop you from celebrating with those you love. so fun, what a perfect way for your fam to feel so loved by you!